A Connecticut state lawmaker was suspended from his leadership post Friday amid reports he could face a criminal charge in the death of a barefoot woman who died of hypothermia after fleeing from his car this past winter. Democratic Rep. James A. O'Rourke III, 45, one of six deputy speakers, will keep his House seat but is suspended indefinitely from his leadership role because the legal case could interfere with his duties, said House Speaker Christopher Donovan. O'Rourke gave a written statement to police in January about the case in which he said the woman appeared to be too intoxicated to drive. At the time, police said it was not a criminal investigation. But on Friday, The Hartford Courant quoted unidentified sources as saying that prosecutors were considering a criminal misdemeanor charge. Prosecutors declined comment to The Associated Press. O'Rourke's attorney, Jake Donovan, said he did not believe an arrest warrant had yet been issued, was unsure whether one would be issued, and that a decision would probably not come for another week. "I'm secure in the knowledge that no crime has been committed," he said. Carol Jean Sinisgalli, 41, of Rocky Hill, was found dead Jan. 22 by a cross-country skier, 10 to 12 feet from railroad tracks. Police said she had walked barefoot about half a mile before collapsing in the snow and freezing to death. O'Rourke told police he was leaving a tavern in Cromwell late on Jan. 21 when Sinisgalli, who had argued with another patron, ran out to his car, pulled open a back door and jumped in. He said he knew the woman through a mutual friend and gave her a ride because he thought she would be a dangerous driver, though he did not know exactly where she lived. Sinisgalli left behind her coat, shoes and purse. Her car was sitting in the bar parking lot. During the ride, O'Rourke said Sinisgalli became belligerent, knocking down his rear view mirror, garage door opener and glasses before jumping out of the car. He said he thought she was close to home and didn't know she was barefoot. Temperatures were in the single digits that night. Her body was found about five hours later. O'Rourke represents the central Connecticut communities of Cromwell, Portland and Middletown. Appointed by Christopher Donovan earlier this year to the leadership post, he has not yet presided over the House during the legislative session. 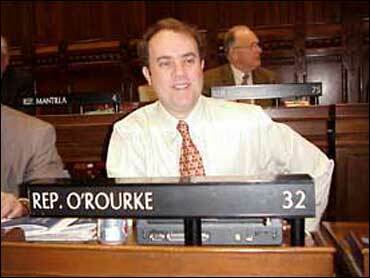 O'Rourke will lose his $6,446 deputy speaker stipend during the suspension, the House speaker's office said. State Republican Party Chairman Christopher Healy called on O'Rourke to explain his actions publicly or resign from the General Assembly, where he has served since 1991.